Theme: White Workers! On Which Side Are You? 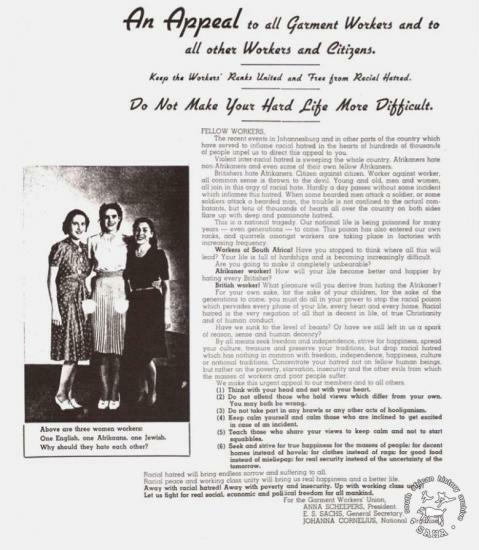 Description: This pamphlet titled 'An Appeal to all Garment Workers and to all other Workers and Citizens' was issued by the Garment Workers Union in the 1940s. While addressing the issue of ethnic prejudice among workers, it focussed only on the whites. The pamphlet is reproduced in black and white on page 15 of Julie Frederikse's book 'The Unbreakable Thread: non-racialism in South Africa' originally published by Ravan Press in 1990. Included in SAHA's online edition of the book and in the virtual exhibition 'Tracing the unbreakable thread: non-racialism in South Africa'.